If you have a Toyota Tacoma, then you know that it’s a great pickup truck, but why stop at great, when it can be legendary? The Toyota Tacoma XP Rockstar Package adds an aggressive edge to your Tacoma without taking away from the reliability and power that you expect from Toyota. Here is a rundown of the great accessories the XP Rockstar Package has to offer. The Toyota XP Rock Star Package includes black XP badging, chrome exhaust tip, stealth black running boards, and 17” Rockstar wheels with BFG Rugged Terrain Tires. The black badging along with the stealth black running boards give your Tacoma an unexpected, tough look. The 17” Rockstar wheels with BFG Rugged Terrain Tires manage to look gritty and polished at the same time. These tough and rugged tires add power and personality to your truck and are an affordable way to make your Tacoma turn heads on the highway. The black 17” wheels look sharp when combined with the stealth black running boards, and the black XP badging; and the chrome exhaust tip only adds to your Tacoma’s sharp new image. The XP Rockstar Package is the one thing that can make your Tacoma even cooler. It is hard to imagine the Toyota Tacoma being any better, but the XP accessories package, takes it to legendary status! The XP Rockstar Package takes your Tacoma to the next level. If you are looking to modify your Tacoma for a more edgy appeal, then check out the XP Rockstar Package. These detailed accessories will have your Tacoma turning even more heads than before. 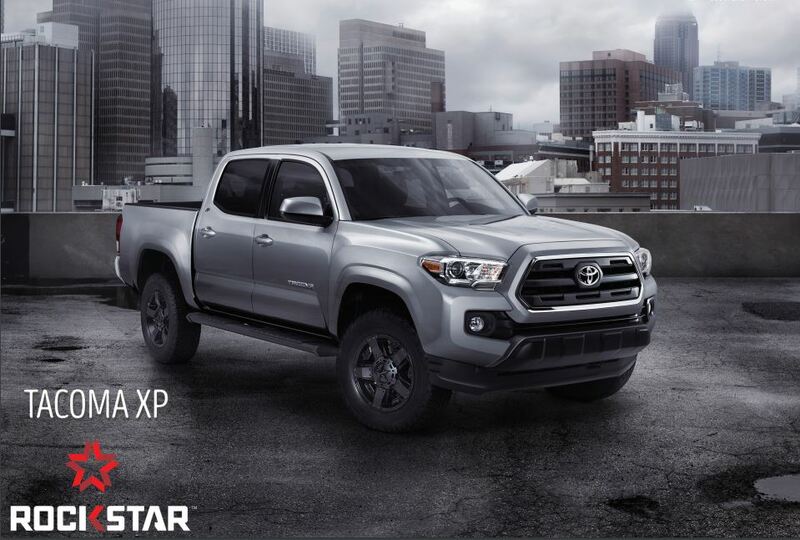 If you are looking to customize your Toyota Tacoma with the XP Rockstar Package, then stop by Limbaugh Toyota today. We are located in beautiful Birmingham, Alabama.